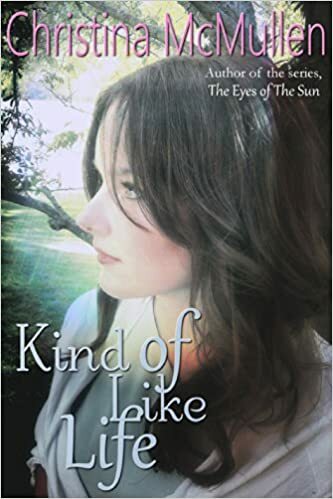 When I started reading Kind of Like Life, by Christina McMullen, I felt the comforting landscape of a familiar genre begin to unroll before me. Renee is an awkward young lady ready to make a fresh start in a new town. She finds that there may be a chance at the life she always wanted in her new surroundings, and her dreams seem to be coming true one by one. By the time a special kind of magic touches her new life, Renee seems poised on the brink of happiness for the first time in all of her angst-riddled years. McMullen sets the scene up perfectly for a heart-warming love story steeped in supernatural discovery, ushering the reader toward excited anticipation at what happens next. Then she pulls the rug out from under you in the most delightful way, and a new pace sets in as a whole new story begins to unfold. We meet Blake just as we discover that Renee is a more complicated character than we may have supposed. We see her multifaceted nature through his eyes, and in the looking he comes alive. The tale takes an unanticipated turn when he steps in, and Renee’s world comes alive to turn her own depth and darkness against her. I found myself transported from a comforting fantasy to a harsh and bitter reality right alongside Renee. I needed to know if she was going to be alright, if there was any way for her to ever be alright; or if the doom surrounding her every moment was going to overtake her, as seemed inevitable. One vivid scenario after another unfolded within this beautifully layered story, and it added a special poignant element to the connection between Renee and Blake. It wasn’t until the pacing drew me quickly to the conclusion that I saw the beautiful shining heart of the tale. I am hesitant to say much more about the actual story, at the risk of being vague. There were so many pleasant surprises for me, as a reader of many genres; and the greatest surprise was that the story grew more believable, and at the same time more fantastical, as it revealed itself. This is a well-crafted tale that I would happily recommend to readers of any genre. I am not a huge fan of romance in and of itself ordinarily, but I was particularly touched by the love story woven subtly into the dark descending hopelessness of this book. Like the story itself, it evolves and grows to reveal layers of meaning that the reader gets to discover right along with the compelling characters. The darkness is an intriguing place for many of us, but there’s always the chance that a story is going to take us too deep into it or leave us feeling too steeped in it. I am personally unable to see the point of a dark story if there’s not some light to be found in it, just as I am often frustrated with an unrealistically light ending to a story rooted in tragedy. While still being as vague as possible, I have to say that the end of this book was as rewarding as its unfolding for me. If you see a good book as being akin to a good fireworks show, and anyone who enjoys both can surely draw an easy comparison, you know the finale is as important as the show itself. This finale left me with all the light I needed, bittersweet tears on my face, and some cold hard reality to think about in a refreshing new way…all the things a good book needs to be great. I look forward to reading the other books Christina McMullen has written. Her easy voice and skillful pacing already have me wondering what other wildly realistic ideas she has brought to life, and her light personal commentary made me feel like I was getting to know her along with her lifelike characters. I can sum up this entire review by reiterating what I said earlier…if you like to read great books in any genre, and especially if you are a cross-genre reader like myself, you are going to love this book! Want to grab a copy of this book for yourself? You’ll find Kind of Like Life at Amazon – click here.